I’ve worked with Jacinta and JEM Textiles for year, from logo and promotional material to her website www.jemtextiles.net. I can honestly say I have yet to meet another person with such dedication & focus. As designers we’ve both grown. 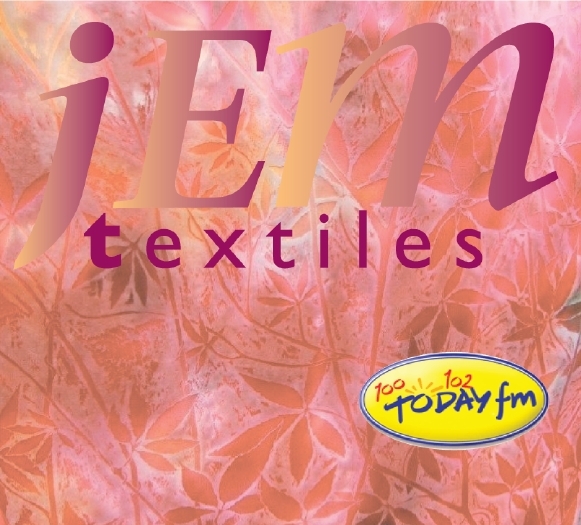 So when Jacinta sent me word that she & Jem Textiles got a mention on Today FMs Business show yesterday. I had to share. Excellent & this is only the first you’ll hear of this innovative product. This is brilliant Jacinta • Jem Textiles new product got an enthusiastic mention on today FMs business show yesterday (Sunday 17th June). The segment begins at 36:00 – 50:00. Sean Mc Nulty enthusiastically mentions Jacinta Edge-Moody of JEM Textiles (at 41:43) • It’s a very very brilliant product • got it right • high end • she’s on the road • enterprise Ireland should pick it up • working with Carlow IT • she’s got Sean Mc Nulty as a Mentor • product launch in September • Working on her own • needs input • needs scale and providing possible investor opportunity in the future. The kind of product that says WoW! We are going places in Ireland.